Mega Sale! Free Shipping Included! 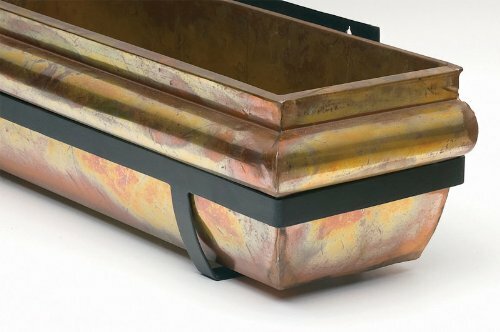 Save 23% on the H Potter Rustic Copper Window Planter Box Garden Decor Flower 36'' by H Potter at Tulips Orchids. MPN: GAR229A 36 INCH. Hurry! Limited time offer. Offer valid only while supplies last. An H. Potter Best Seller, the rustic copper window box. Designed and Manufactured by H Potter Stainless steel construction with rustic copper finish. HEAVY & DURABLE CONSTRUCTION - Each rectangular window box is hand-crafted. Thick iron is welded into a sturdy frame and finished with a classic black, powder-coated, protective finish. The planting liner is stainless steel with a rustic copper finish. The organic texture of stainless steel naturally resists rust and corrosion. Mounting brackets are included. Drainage holes in liner provide excellent drainage. OUTDOOR WINDOW BOX PLANTER - Liner is 36 inches long by 7 inches tall by 8.25 inches wide, this large size window planter will make a dramatic statement wherever it's placed. Unique and sturdy, it's flat on the back side to sit flush against the mounting surface. If you're looking for something different, this is a window box your neighbors will envy. Thinking minimalistic, fill your H Potter window box with succulent plants or flowers in pots or urns to create simplistic curb appeal. SECURELY PACKAGED AND BUILT TO LAST - A decorative way to display your favorite blooms outdoors, the rustic 36 inch window box planter will add a natural warmth to your outdoor décor. It has a wide mouth top, which lets the plants breathe and grow properly. Sturdy yet lightweight - brackets make removal easy for planting and care for everyone from gardeners to landscapers to designers. QUALITY BY H POTTER - H Potter has been designing and manufacturing premium quality garden products since 1997. We do not pretend to be the cheapest, but you get what you pay for. Packaged well, with stunning craftsmanship and backed by great customer service, we're proud to say our garden products are built to last. Also available from H Potter window box planters in 30 inch length and 48 inch length.